A cookery copied on a roll might seem unwieldy and impractical to the modern mind. Who would record lists of recipes on a long strip of parchment, only to roll it up again for storage? Not to mention if one needed to quickly reference a single item… Would the entire roll be stretched out twenty feet just to doublecheck the ingredients necessary for a dish of blanc manger? The roll, however, was still a format in wide use in the fourteenth century–and not just for legal records, genealogies, and the like. Practical and oft-used texts such as verse and prose prayers, charms, and medical recipes were also recorded on rolls. Smaller rolls were practical, portable, and easy to use: all necessary characteristics of a used cookbook. Three medieval French and English cookeries survive as rolls: Sion, Archives cantonales du Valais, MS Supersaxo 108; New York, Morgan Library, MS Bühler 36; and London, British Library, MS Additional 5016. Displaying the most famous and iconic medieval cookbooks, Bühler 36 and Additional 5016 are copies of the English Forme of Cury, while S 108 is a copy of the French Viandier of Taillevent. These three undecorated cookery rolls are heavily worn, with sections of text rubbed off or bits of brittle parchment crumbled away. The earliest of the three rolls, S 108, which is dated to the second half of the thirteenth century, exhibits signs of regular use. Although the edges are relatively unscathed, the width of the parchment shows creases where the parchment looks like it was purposely folded to better see a recipe, a preparation for conger eel (located under line 400 on the verso side). Other creases are visible throughout the bottom third of the roll. The regularity of these creases suggests that pressure was applied to the roll of parchment, slightly flattening the roll. Stains of unidentifiable substances adhere to both sides of the roll. Finally, some ink has worn away on the roll. The worst wear can be found around line 90 on the recto side. This is a part of the text which should have been safely rolled between several layers of parchment, protecting it from any significant wear. The appearance of such significant wear in a concentrated area suggests the roll was regularly opened to that particular spot, causing a gradual disintegration of the ink. 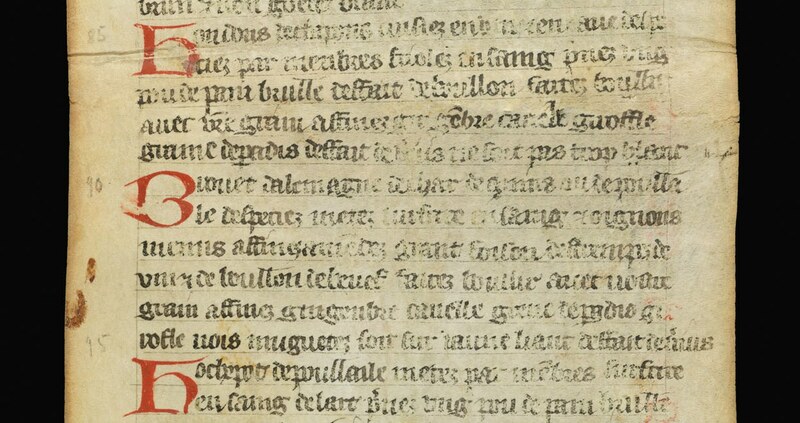 The two roll copies of the Forme of Cury also show signs of significant use. Additional 5016 contains innumerable tears and the ink and parchment are faded throughout. 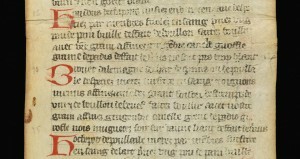 The fifteenth-century roll Bühler 36 is in the worst condition of the lot. Chunks of parchment are missing from the edges of the first leaves of the roll. Although the stability of the parchment improves the farther inside the roll, there are stains in the interior of the roll. Additionally, the red ink is in such unstable condition that the library issues a warning with the roll to use caution since the ink flakes off the parchment. 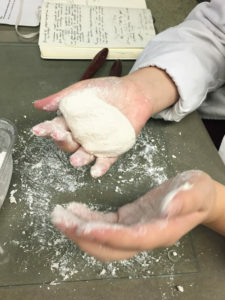 A reader, such as a household steward, head chef, or even a literate cook, could insert the lightweight and flexible roll into a pocket or hold it open on a table with heavier objects. The extensive wear on the rolls certainly supports this type of use. Bruno Laurioux has also suggested that cookery rolls were a practical format which could be held in the hand or placed in the belt, or even hung on the wall. While other cookeries lacked manageability in an active kitchen, the roll was an attractive and versatile alternative. Moreover, its ease of use was further enhanced by the addition of introductory tables, as in Additional 5016 and S 108, and rubrication, which appears in each extant roll. 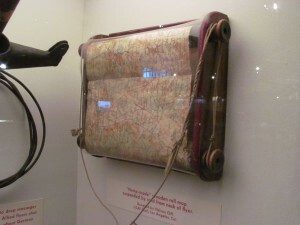 One of several roll maps with mounting and hanging mechanisms on exhibit at the National Museum of the US Air Force in Dayton, Ohio. Photo: Sarah Kernan, October 2012. The very factors of rolls’ practicality—the aspects that provided for their benefit in the kitchen—remain the form’s assets well into the twentieth century. For example, the roll navigational map used by French, English, and American World War I fighter pilots in combat, provided a large volume of material contained in a small space. Like the cook seeking a reminder of a few measurements, the pilot simply rolled the map to the required portion, while keeping the rest conveniently stored. And as the cook could unfold a portion of a roll on his work space or stuff it in a pocket or belt, the pilot’s map could be mounted in the cockpit or hung around his neck. Despite the dramatic differences in time and place, the advantages of the roll’s flexibility and use draw together settings such as the medieval kitchen and the wartime cockpit. The roll provides a helpful reminder that in understanding medieval cookery, the practical requirements of the cook and kitchen are of paramount importance. Bruno Laurioux, Les règne de Taillevent. Livres et pratiques culinaires à la fin du Moyen Âge (Publications de la Sorbonne, 1997), 332 and 343. What Was Perfume in the Eighteenth Century? Simon Barbe, Le Parfumeur Royal, Paris, 1699. Image Credit: BIU Santé, http://www2.biusante. Perfume as we know it is a sweet smelling liquid made from natural and synthetic aromatic ingredients. Yet, far from being a mere scent, perfume is also a fashion accessory, tool of self-definition, and convenient gift. Perfumes are now branded so successfully that names and bottles are often more recognizable than actual smells. It is easy to imagine that perfume in the past was much the same. For instance, conventional histories of perfume remind us that in the eighteenth century, perfume was luxurious and worn by female courtiers, amongst others, to demonstrate their social status. This was undoubtedly the case. But a variety of evidence reveals that, during this period, perfume had multiple uses and meanings that are readily overlooked if we simply seek out the familiar present in the past. One kind of evidence comes from perfumers’ business records. Stock inventories, account books, and sale receipts allow us to form a more nuanced impression of what perfumers sold, how much their products cost, and how they changed over time. In the late 1700s, the best-selling products available from perfumers in major European cities such as London and Paris included (as one might imagine) scented waters. 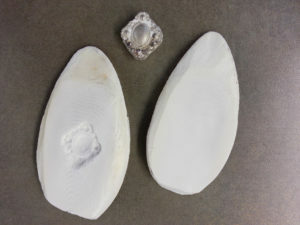 However, they also included items that one would not associate with perfumers today: soap for the body, powders and pomades for the hair, alongside an assortment of tongue scrapers, tooth brushes, and toothpaste that reflected the new obsession with oral hygiene – the latter trend explored by Colin Jones in The Smile Revolution. A third kind of evidence consists of medical treatises. These show that some circles considered perfumes effective medicines. As in previous centuries, perfume reputedly prevented and cured plague. But, in the 1700s, when outbreaks of bubonic plague ceased in Western Europe, perfume was set to work strengthening body and mind, preventing spasms, and curing lethargy. In the 1770s, for example, physician Pierre Lalouette invented a fumigation machine that used perfumes to treat venereal disease. 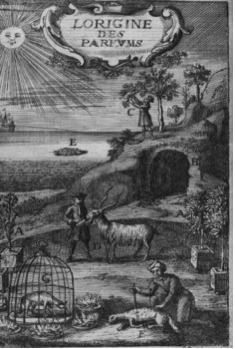 Several ingredients burnt in his machine could be purchased from the perfumer’s boutique; these included frankincense, nutmeg, myrrh, and juniper. Others, such as mercury and sulphur, remained exclusive to druggists and apothecaries because they were considered dangerous. A final kind of evidence is arguably even more useful for showing the different uses and meanings of perfume. Other contributions to this blog demonstrate how recipes can reveal much about the past. Printed and manuscript recipes for perfumes are no exception. Recipes in pharmacopoeias confirm that physicians believed in the medicinal properties of perfumes. Pharmacopoia Bateana (1706) claimed that the “Royal Essence” (consisting of musk, civet, balsam of Peru, clove oil, rhodium oil, tartar salt and cinnamon) could form an “odoriferous water” that prevented “fainting fits.” Various manuscript collections (such as those in the Wellcome Collection) include recipes for masking stenches, purifying the air, preventing aging, and enhancing beauty. Such books indicate how the use of perfume changed. In the early 1700s, the emphasis was still on scenting waters, gloves, linens, and homes. By the second half of the 1700s, however, the emphasis switched from perfuming things and places to perfuming the body. For instance, The Toilet of Flora (1784) recommended that “Hungary-Water” (made from rosemary, pennyroyal and marjoram flowers mixed with conic brandy) be used “to bathe the face and limbs, or any part affected with pains” in order to cleanse and strengthen the body. As these different sets of evidence suggest, perfume in the eighteenth century was multifarious, and the history of the word “perfume” is consistent with these multiple uses and meanings. The word derives from the Latin per fumum (“through smoke”), and throughout the seventeenth century perfume usually referred to substances that released odour when heated. However, by the mid-eighteenth century the “agreeable odour” of perfume was as likely to feature in dictionary definitions as its medical uses. 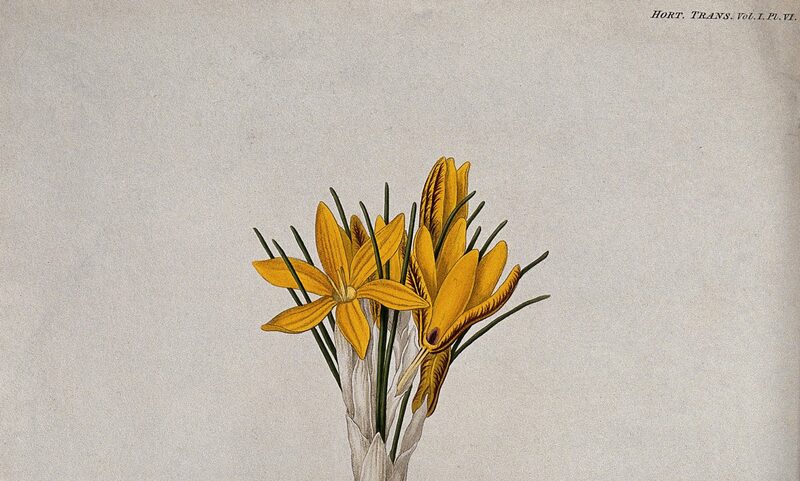 By the early nineteenth century, some dictionaries referred to the purported medicinal uses of perfumes as an anachronism, while adding that perfumes were increasingly sought after for their refined and luxurious scents. It would not be until the nineteenth century, then, that the meaning and uses of perfume – though not its marketing – took on a character that looks decidedly familiar to us. November was a bountiful month for food in medieval Europe. The harvest was completed, wine and cider were quietly fermenting, and animals were nearing slaughter. 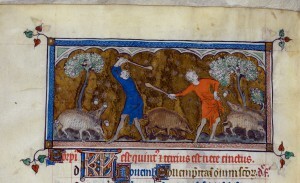 The fattening of pigs is the most consistent of images in medieval illuminated Books of Hours for the monthly labor of November. Queen Mary Psalter (England, c. 1310–1320): London, British Library, Royal 2 B VII, f. 81v. Source: British Library. November was liturgically balanced between a long stretch of Ordinary Time and Advent’s four weeks of fasting. The month was dotted with holy days and feast days, including All Saints Day, All Souls Day, and the Feast of Saint Andrew. Le Ménagier de Paris, a guide, written in the 1390s, for the young wife of a bourgeois household, contains numerous references to these November holy days. (For more on the Ménagier, see Tovah Bender’s post about using this text as a teaching tool.) In the Ménagier, seasonality is marked by feasts: on Saint Andrew’s Day, people were instructed to preserve parsley and fennel root, sheep quarters were salted in Béziers, and the wood pigeon season which would run until Lent commenced. Martinmas—the Feast of Saint Martin of Tours—on November 11, was the official seasonal turning point. Martinmas was a continent-wide day of celebration and feasting. Like the modern American Thanksgiving, the feast day secondarily celebrated the end of the harvest. Both feasts featured a centerpiece bird; Martinmas, as well as Saint Martin himself, was closely associated with geese rather than turkey. The saint and his feast day were linked to the feast-friendly fowl as a nod to the gaggle of geese that supposedly revealed his hiding place to the people who wanted Martin to become their bishop. tear it up, devour it! let it go all around! English and French cookeries from the preceding centuries contain tens of recipes for goose preparations, exhibiting the popularity and widespread use of the bird. The famed Viandier of Taillevent (late thirteenth-century) contains only one recipe for goose, yet refers to the preparation of geese in several other recipes, indicating that the goose was a typical bird for consumption in French royal households. Only a cook with experience preparing geese would have been comfortable following directions such as “it is plucked dry like a goose” and “it is killed as a goose” in recipes for swan, peacock, and stork. Le Ménagier de Paris also contains similar references to geese in other poultry recipes. The text also contains many more recipes for geese, including pottages, pasties, and hochepot. Sauces were recommended for service with roast goose, and the author even included instructions for fattening the animal. English cookeries contain at least twelve different preparations over thirty times, including goose in gauncele, goose in sauce madame, and stuffed goose. The Feast of Saint Martin was a seasonal marker for many other meats; in fact, Martinmas signaled a yearly slaughter. Meat was very plentiful and less expensive at market, while large estates and households had an annual stockpile of meat and embarked upon the huge task of preserving their supply. We also learn from Le Ménagier de Paris that the hunting period for animals such as boar extended from September to Martinmas. Those images of November’s task, the fattening of the pig, not only signaled the season’s import for food production and consumption, but reminded the medieval cook of the fruitfulness of this period situated between days of plenty and want. The liturgical calendar and seasonal availability of foodstuffs combined to make November a tasty treat. Gina L. Greco and Christine M. Rose, trans., The Good Wife’s Guide (Le Ménagier de Paris): A Medieval Household Book (Cornell University Press, 2009), 328, 274, 299. Yossi Maurey, Medieval Music, Legend, and the Cult of St Martin (Cambridge University Press, 2014), 123. Terence Scully, ed., The Viandier of Taillevent: An Edition of all Extant Manuscripts (University of Ottawa Press, 1988), 285. Greco and Rose, 283, 289, 339, 321, 298.